Why does smart advertise 160 km (100 miles) of range on electricity, but when I google the range it says 58 miles? Where does it say 100 miles? Even the window stickers show much less, i.e. around 60 to 70 depending on what model you're looking at. I typically get up to 80 in the summer and 65 or so in the winter. If the image doesn’t work, here is the link. Your links go to the smart worldwide site (smart.com) The US site, smartusa.com, lists the range as 58 miles or 93.3 Km. Europe and the US use different methods to calculate range, I believe. And both seem to be somewhat off in opposite directions from the real-world average range. During the summer the range increases into the mid 90 mile range. 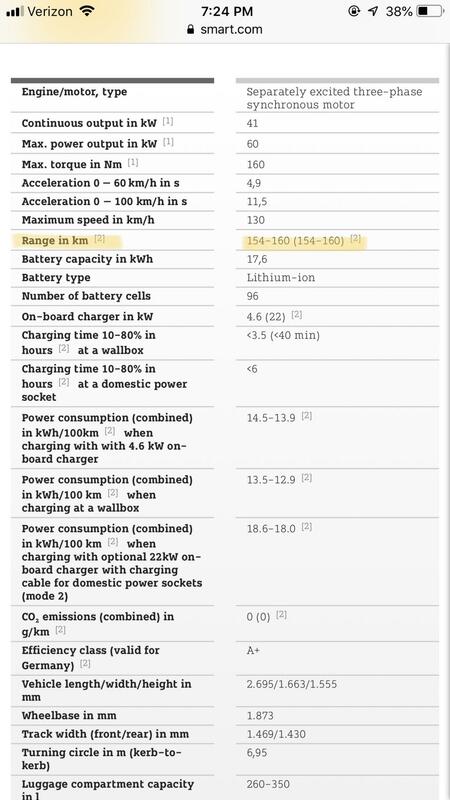 NEDC (new European Driving Cycle) lists it as 160km/100 mi but that test is known for being very optimistic. I'm very curious what a smart EQ Fortwo would do for range in a place like Chicago today with in -30F weather. I messaged the smart brand manager in Chicago to see if they're willing to test it out. no reply yet. I have the getting about the same results in Southern Oregon... 50ish miles with heat on in Winter, 65ish miles with air on in summer.